First, I want to thank you all for your emails, comments, messages, and prayers after I shared about our miscarriage. My husband and I have felt an incredible amount of support and love from many people over the last month, and we are grateful. When people ask how I’m doing I typically respond “I have good days and bad days.” I’ve learned that grieving is a process. There are days when I’m at peace, and there are days when it’s hard to smile. I’ve been able to hold myself together pretty well, especially when I’m around other people. Sure, there are a tears that leak out from time to time, but if I cry it isn’t much more than that. Last week, however, something happened. I guess it was what folks call a “trigger” and it came without warning. And I bawled for the first time since I lost the baby. I’ve cried several times since December 15th, but nothing like this gut wrenching, sobbing, ugly cry. Something set me off and it took me a moment before I was able to calm down and breathe again. When the sobbing was over I realized two very important things. hurting like this reminds me that I really am Pro-Life. It sounds almost silly to say it; it’s such a simple truth. We lost a baby. It wasn’t a foreign blob of tissue that perhaps someday might become worthy of our care… This was our child. My husband and I have always been pro-life Catholics. My high school led the March for Life in 2001, and I participated in the March all 4 years of high school. Both of us have been part of various pro-life efforts in our parishes and dioceses throughout our lives. 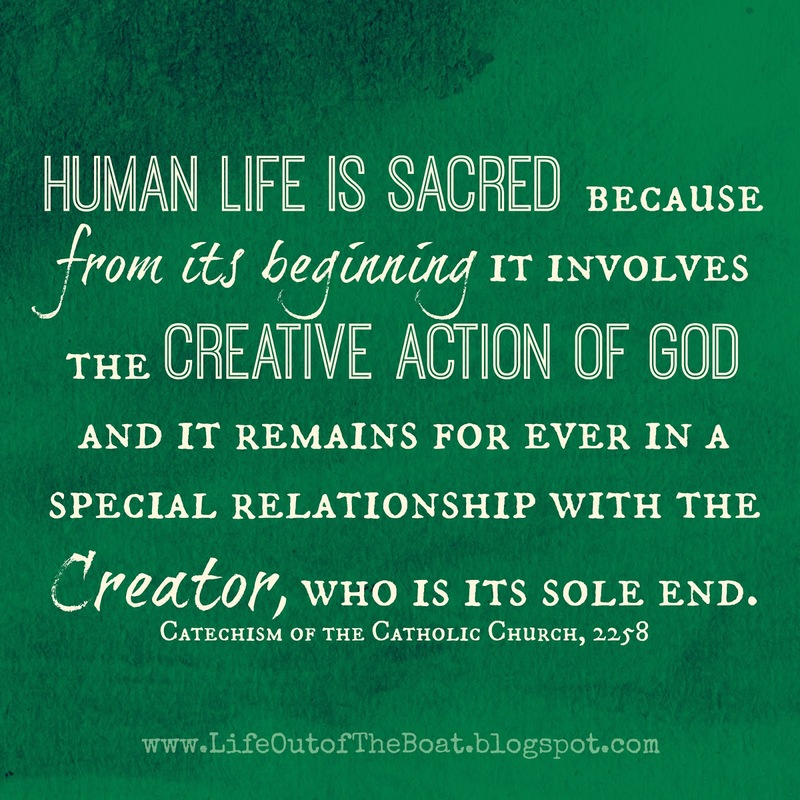 We’ve never doubted that a human life is sacred and worth protecting “from the moment of conception to natural death.” It just makes sense. But there’s something about that “from the moment of conception” piece that I don’t think really hit us until we lost this baby. When we found out that we were pregnant with Alexandria we knew she was a baby human, no doubt. But I think that as the pregnancy continued, it became more and more obvious that this was a little person who would make her “humanity” known to me especially by lodging her foot in my rib cage or punching the heck out of my stomach. This time it was different. I only carried the baby we lost for 7 weeks. But just because that child hadn’t yet formed 10 fingers and 10 toes, didn’t make him any less human. 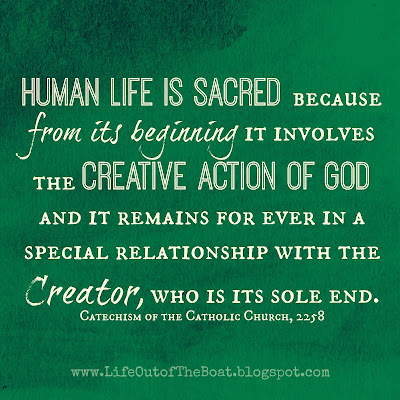 From the moment this baby was conceived there was a human being with a soul… a child of God worth loving and protecting. And that is why this hurts. We lost our child. This was not a blob of tissue or a “potential” human being. This was our child, and if we didn’t believe that this was a person then I don’t think we would feel the ache the way that we do. I’m not grieving that we lost what maybe could have eventually turned into a baby. That anyone would dare to say that’s the reason why mothers who have experienced miscarriage are mourning is , quite frankly, insulting. In a way, I’m grateful for this ache. It hurts because we lost a child, a person with a soul. But that also means that I have the great hope of meeting him someday, which brings me joy and peace. Pray for us, Little Saint. We look forward to meeting you someday! Just beautiful, Deanna!!! God knows. I love you! !